This is the first of a three week series on women speaking up. 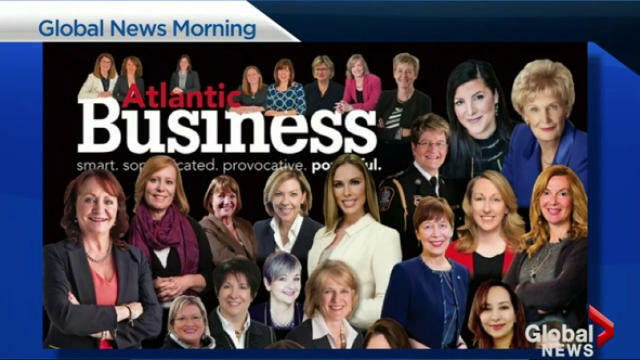 To kick off, the Atlantic Business Magazine in Canada is spotlighted. The leading business mag released an awesome January issue. I say awesome! It was an all women cover. This created a twitter backlash and and some pretty negative comments. Despite this, Eleanor Beaton, who was on the cover, spoke up with strength and courage about what she believes in- which is us. Women leading. It’s a short clip and well worth the watch. Click the pic. Hello, its the first day of summer. I hope your enjoying the good weather. This is a quick post this week. I attended the Women of the Year Lecture recently, and was introduced to the most amazing woman. I was quite embarrassed that I had never heard of her, given all that she achieved. Dame Stephanie Shirley had quite a challenging upbringing, having fled Natzi Germany during the war, she was taken in by a British family, arriving with her siter as a refugee. She suffered great loss as an adult with the death of her only child. There were challenges in business as well for her. So much so, she used the name Steve in business correspondence. Shirley achieved many things despite these setbacks. She became one of the pioneering female coders in the 60s, her company was responsible for coding the Concorde’s black box. And, when she floated her company she made many of her employees, alongside herself, millionaires. I’m highlighting Shirley not only because of the amazing things she has achieved in tech, but because her story of challenges were equally important in forming who she became and what she achieved for herself and for other women. Her courageous, and heartfelt discussion was very moving and I recommend her book, check it out. So, how are you? Done something scarey recently? Well up until last month, its been a while since I have done anything truly scare. But in April, I bit the bullet, I met and overcame a challenge.Thats me on the left, getting into Manhattan for the first time. As a nervous flyer who always wanted to go to the big apple, I was going to have to tackle my limiting beliefs. That’s exactly what I did. I flew 9 hours from London to JFK, via Shannon. Why the long way round? I wanted to support myself and process immigration in Ireland- it makes the journey much easier. A bit of nerves in the immediate run up, but it was well worth it. Manhattan was all it was said to be. Fast, big and, had to be experienced first hand. I went to Harlem, Wall Street, the United Nations, Central Park, Fifth Avenue and the Lincoln Center to name a few places. It was just amazing. Eating out was fab and the people so friendly. Consistency, once I decided to go, I paid the ticket straight away. There was no going back! Benefits: I focused on what I was getting at the other end of the flight, I really ramped that bit up. I spent a lot of time thinking about what I was going to gain. Support: I softened the parts of the challenge where I could. I flew business class and made immigration smoother. How have you challenged yourself recently, and what lessons has that provided you with supporting others through change? I would love to hear from you in the comments box bellow. After queuing for over an hour, we finally got in. While very busy, the portraits were stunning. Above are a couple of shots. If the exhibition comes to a city near you, do try and see them. You will get a chance to see photos from one of the most iconic photographer of our age. The exhibition kicked off in London and will be shown in Tokyo, San Francisco, Singapore, Hong Kong, Mexico City, Istanbul, Frankfurt, New York and Zurich. I was quite taken by what to me seemed to me to be a study of women’s leadership. The photos showed women who lead at the grass roots, in the social sciences, politics, business, science, arts and philanthropy. Really powerful stuff.